Truism: for BRMs to be truly effective they must perform at the highest levels of an organization and positively contribute to its success. We all know this to be true. However, it is one thing to know, and yet another to execute when it comes to BRM development. The BRM landscape is littered with stories of BRM programs that can’t get traction, or business partners and colleagues that aren’t seeing the “value.” Often, the BRMs did the right things: they obtained their certifications, received a commitment from their management, and followed a playbook. So, what went wrong? Many factors could lead to challenging results from a BRM program, including those specific to an organization’s politics, culture, or industry. However, there is usually one common flaw in many BRM programs that leads to their demise – the inability to properly develop and evolve talent for the specific demands placed upon the BRM role. The BRM role is not easy. It requires people to operate at an executive level – in essence as CIO’s to the business units they cover. They must be able to communicate, lead, influence, plan, and negotiate with senior management. BRMs must possess a wide range of knowledge, from business acumen to technology awareness, and how to operate effectively at executive levels. As leaders within their organizations, BRMs must be the most informed person in the room. They are constantly on the front lines and share ownership for the success of all initiatives implemented with their business partners. As such, it is important that they operate from a position of strength to avoid being seen simply as point-people. As leaders within their organizations, BRMs must be the most informed person in the room. Business partners will rely on BRMs to know all about the specialty of their team/department, how it connects to business goals and strategy, and to provide input on maximizing effectiveness and investment. Still want the job? Of course you do! Who wouldn’t? However, most organizations fail to provide the necessary skills development needed to perform the role. 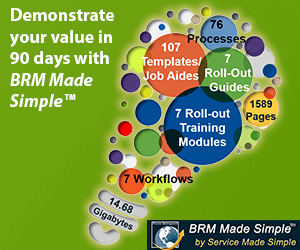 Typically, BRMs are given standard development training even though they must perform at a higher level than most. Moreover, the same level of training is given to all BRMs, regardless of current skill level, background, or aptitude. Assess – before creating a development program, assess the existing skill set of team members. Evaluate their hard skills, soft skills, and intangibles. Have their business partners rate them, their colleagues, and even themselves. Get a good sense for individual and team strengths/weaknesses to determine the right training needed for the team. BRM Institutes provides a list of terms to help teams with their assessment activities. Develop – create and execute a development program for the team that provides executive-level soft skills along with the hard skills needed in the business and technology areas. Think big here and get veterans from your company who live in these spaces to help. A dynamic, effective program does not have to be expensive. Evolve – true talent is developed over time, not in one class. Reiterate common themes and evaluate people on their specific learning plans. Identify skill-based goals for the team. And most importantly, “rinse and repeat” steps 1 and 2 continually over time. Using this approach requires a cohesive understanding of how to assess a BRM team; BRM Institutes provides a list of terms to help teams get there. The BRM team has a great responsibility in this. They must be willing to put in the time and effort to develop the needed skills- which is much more than attending a class and getting a certificate. They must practice and hone their craft and continue their development on a continual basis. They must share experiences with one another to learn from experience. They must put talent development at the top of the list. The payback from providing the essential skills needed by BRMs to carry out their roles is enormous. Yes, they become more marketable, but they also become more effective for your organization. Jeff Warren is the President of Barkley Consulting Group, a Management Consulting Firm that combines real-world experience with thought leadership to bring transformative solutions to organizations. He is a guest lecturer and speaker and works in an advisory capacity for start-ups in the technology sector. In addition to his consulting practice, Jeff also serves as the Program Director for Design Thinking at Stony Brook University.